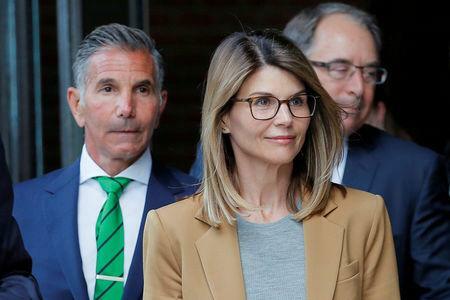 BOSTON (Reuters) - Actress Lori Loughlin on Monday entered a not guilty plea to charges that she participated in a wide-ranging college admissions scam by paying bribes to get her two daughters admitted to the University of Southern California. Loughlin, who starred in the television sitcom "Full House," and her fashion designer husband Mossimo Giannulli filed papers in federal court in Boston waiving their personal appearances at an arraignment hearing and asking to have not guilty pleas entered on their behalf. California college admissions consultant William "Rick" Singer pleaded guilty in March to charges that helped parents facilitate cheating on college entrance exams and bribed coaches at universities to falsely present their children as athletic recruits. Prosecutors allege that Loughlin, 54, and Giannulli agreed with Singer to pay $500,000 to have their two daughters named as recruits to USC's crew team, even though they did not row competitively, to help them gain admission. In all, 33 parents have been charged in the college admissions scandal. Of those, 13 have agreed to plead guilty, including "Desperate Housewives" TV star Felicity Huffman. She is scheduled to plead guilty on May 21.